The Calcu-pen is a very unique calculator from the 1975 to 1977 time-frame. One of the earliest ads from 1975 shows the Phenix International company of Wayne, New Jersey (USA) selling the Calcu-pen for $79.95. Ads in Scientific American from early 1977 show the price as low as $19.95. The actual manufacturer is not known and is not present on any of the currently-known printed materials for the calculator (such as sales ads and operating manual). 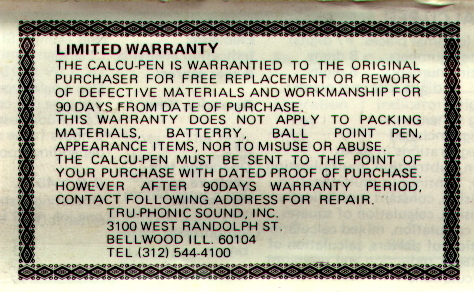 The back cover of the operating manual has a guarantee with returns to be sent to Tru-phonic Sound company of Bellwood, Illinois (USA), but that may have just been one US distributor or servicing agent. An LCD version of a Calcu-pen (with the same spelling) was made in 1981 by Satolex, an Asian company. There may be a connection. The calculator is made out of metal and constructed very well. It is shaped much like a cigar tube, 6.3 inches long and about 0.6 inches in diameter. The five keys on the barrel are termed "Quadraplane" rocker switches in the Phenix ad. Each switch will rock in four directions, allowing four numbers or functions per key. The display is an eight-digit red LED. The Calcu-pen is powered by a single "N" sized replaceable battery. The on/off function is controlled by rotating the end cap of the pen -- opposite the pen end. The pen itself is a small ballpoint which moves into position by rotating the pen nib end. When rotated up into the barrel, the pen tip is completely protected. The illustrations below show the manual for the Calcu-pen. The scans were supplied by Don DiGalbo. Thanks Don! If you have any additional information on the Calcu-pen (or additional ad pictures), please contact me at the address above. Thanks!